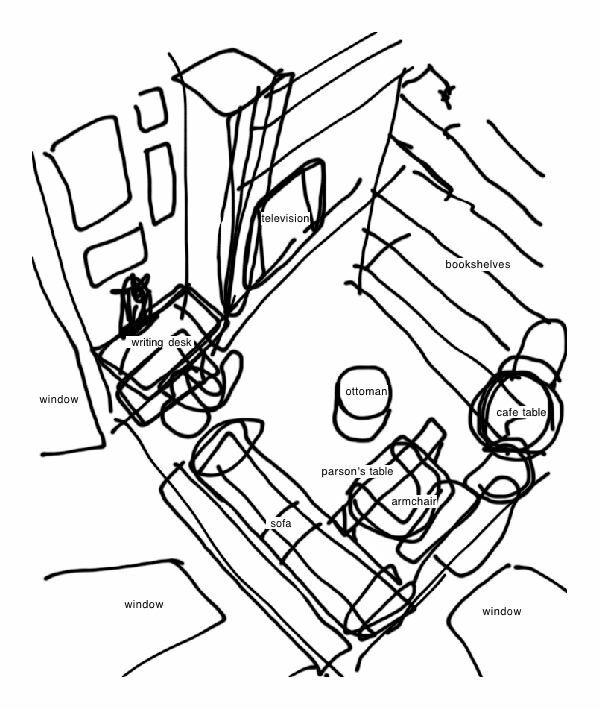 This is a sketch of my personal scriptorium, which I realised I had access to all along: my living room. I have five places to sit, three of these for writing. My father has built me a 'parson's table' that sits over my armchair, which is the final jewel in the crown. The table arrives from interstate with mum and dad tomorrow, and when I have it in place I will have my own personal version of the bridge of the Starship Enterprise. Now if only I can go where no one has gone before, writing-wise. Once a nerd, always a nerd. Many thanks to the divine Ms. Henderson for leading directly to this most apt solution to the writing cabinet problem, and for introducing me to the concept of the parson's table.